Photo by Richard Foreman © Lionsgate 2007. All Rights Reserved. Photo by Andrew Menzies © Lionsgate 2007. All Rights Reserved. The fortunes of the Western as a movie genre have seen a rise and fall. Once a staple of the film industry, this quintessentially American art form gradually lost popularity. There was a minor resurgence in the 1990s, culminating in THE UNFORGIVEN, but only a fistful of Westerns, notably BROKEBACK MOUNTAIN, have emerged in the last decade. 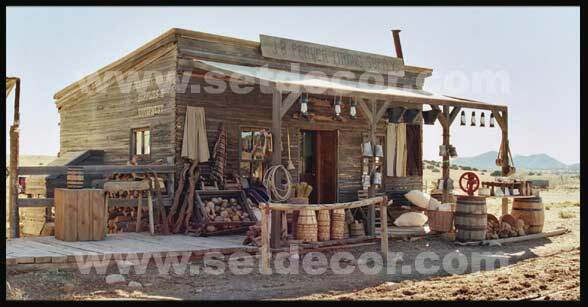 However, the 1957 Western 3:10 TO YUMA has enjoyed a minor cult following over the years. Now, fifty years after the original version hit movie screens, Director James Mangold [WALK THE LINE], Production Designer Andrew Menzies, Set Decorator Jay Hart SDSA and their teams are bringing their vision to a remake of the Elmore Leonard story. 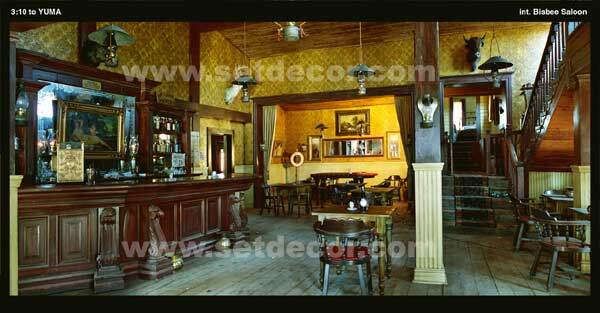 Hart gives SET DECOR a first-person account of the making of the film. Director Jim Mangold, Production Designer Andrew Menzies and I wanted to make 3:10 TO YUMA a gritty Western. This was driven by the script, which called for two Arizona frontier towns. Bisbee sits as a quiet settlement mainly inhabited by farmers and merchants, while the larger, bawdier Contention is filled with saloons, gaming halls, bordellos and a much rougher population. The entire region is supposed to be in a drought, so we worked hard to give a worn, haggard and faded look to both towns. Keying off the natural palette of New Mexico, we kept the colors either sun-bleached or earth-saturated, emblematic of both places. Bisbee, aa small town that has retained its innocence, is the hometown of the Christian Bale character, Dan Evans. Basically four corners, it contains the minimum essentials for a frontier town: Sheriff’s Office, Boarding House, Mercantile, Butcher Shop, Veterinarian’s Office and Blacksmith Shop. An important part of the story hinges on the railroad and the impact it had on the West. The railroad has not yet reached Bisbee, but surveyors are in evidence in the background. We showed that the railroad was on its way with piles of railroad ties, a water tower being built, tents for railroad workers. The Evans Farmstead lies outside of town. The house looks somewhat impoverished, but it is well taken care of by the family. We wanted to convey that, although the Evans were facing hard times, at their core they were a loving couple and family. All the set dressing had to help telegraph the idea that these were the good guys. We tried to make it a snug home, a safe haven. We used furniture that was slightly rounded in line and form, not hard-edged. 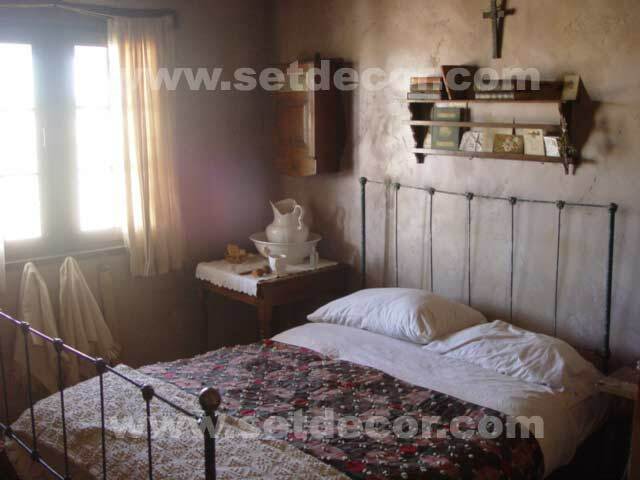 Fabrics were uniformly warm in color and soft in texture. We made a lot of the furniture, thinking that they could have only brought what would fit in a covered wagon and the rest Evans and his sons would have made by hand. Our large frontier town, Contention, already has the railroad. It grew very fast and has a much harsher, meaner vibe. We built Contention from the ground up on a 20,000 acre ranch in New Mexico. Andrew chose a location on the ranch that had amazing mountain vistas and absolutely no manmade items visible in any direction. 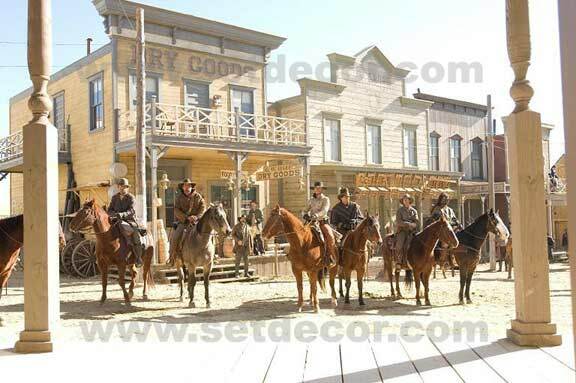 Part of the storyline was a chase on horseback into the town, so we had to build our sets on all sides, not one-sided facades. The town consisted of a main street and four side streets, as well as a working railroad with a depot and a tent village for the “Coolie” railroad workers. We laid a half mile of railroad track, brought in two vintage railroad cars and built a two-story hotel with a working bar, rooms and public spaces. We wanted to be as realistic as possible. A lot of westerns that we watched for reference seemed overly stylized, so we focused on what would have truly been there in 1870. This meant that anything in the town would have had to come via wagon or on the train. Our largest Contention set was the Contention Hotel. 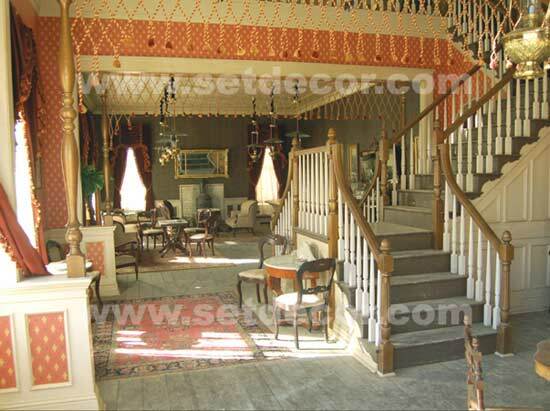 When Evans and the outlaw Ben Wade [Russell Crowe] arrive in town, they slip into the hotel through the back entrance and stay in the Honeymoon Suite. 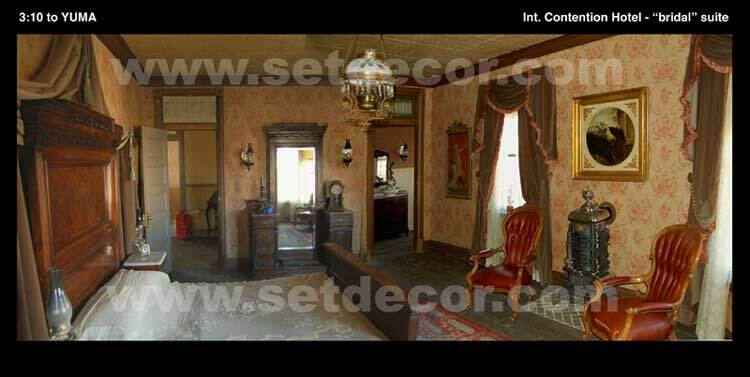 The Suite was probably the most posh room in the town, by 1870 frontier standards. The furniture would probably have come from Chicago on the train, so we shopped for a bedroom suite in the early Victorian Style. We had difficulty finding heat stoves that were correct for the period and ended up discovering a source in Aspen, Colorado. We did not want to deviate from our faded color palette, so we chose brown velvets, neutral wall papers and dark furniture. I have always wanted to do a film sans electric lighting for the practicals. Although the time period was right, the majority of our film was set in the daytime so there were limited opportunities to really capture the warm sepia glow of oil-driven lighting. However, the hotel offered a perfect situation. I spent weeks purchasing oil lamps with interesting shapes and shades that would look great on film. Afterwards, our cinematographer ran tests and determined that oil lamps would not provide a sufficient level of illumination for photographic purposes! We had to convert the oil lamps to function with electric bulbs, which meant all of the color temperatures of the lights ended up the same. This was a huge disappointment. The upside was that in the search for the proper oil lamps, we found a great group of sources: companies that manufacture things for Civil War re-enactors. They provided access to light fixtures, cooking equipment, tents and other period ephemera. We had only eight weeks of prep from the time I got to New Mexico until we started shooting, so I made a conscious decision to shop locally as much as possible. Because of our commitment to realism, I spent a lot of time talking to locals, especially antique dealers, about what would have been appropriate for the time period in that area. I purchased old books from the antique stores and studied them to get a vibe of what life was like in 1870. We also researched the Library of Congress archives. I received great support from other set decorators. Maria Nay SDSA sent me her research from DEADWOOD. Wendy Barnes SDSA, who lives in New Mexico, Nancy Haigh and others supplied me with resource lists. When the script called for specifics, we went to historians at the University of New Mexico. For example, the script contained a Veterinarian’s Office. We learned there was no such thing in 1870! We were ahead of our timeline by about 10 to 15 years. Thus, we took liberties with what that interior would be. One of the fun aspects of film-making is that sometimes you get to make things up! Andrew gave me considerable independence to bring ideas to the table. He was a pleasure to work with. We did do some fabrication, including many tent structures which eventually had to be re-built. [See below.] A blacksmith from the northern mountains of New Mexico assembled our Blacksmith Shop. He built the ovens and brought in the equipment: anvils, tools, iron and other elements. Drapery Foreman Dennis Reiwerts fabricated all of the drapery on site and did all of the upholstery and drapery installation. We hired local crew to assist him. I enjoyed working with the New Mexico crew and found them to be committed and able. We worked under severe weather conditions and they never wavered. The most difficult aspect of the making of this Western was the physical nature of the work. We were outside in harsh conditions, which took a toll on all of us. The plains of New Mexico have a somewhat constant wind—grueling when trying to dress exterior sets. It is especially tough in winter. The most difficult episode occurred after we broke for Christmas. It began to snow and did not stop for three days. In fact, it set a 50-year snowfall record. Ironically, there was not supposed to be a flake of snow in the movie, yet 37 inches of snow covered the ground, burying our town and crushing the tents. Location Manager Mike Fantasia returned to New Mexico and marshaled the people who were still there: his department and the art, construction and set decorating departments. We literally had to cross-country ski into the set—none of the roads were accessible. What we saw was daunting. Shutting down was not an option, so we formulated a plan to dig out more than four acres of scenery. We hired 75 additional people to shovel snow off roof-tops into the center of the streets. Snow shovels were not available locally; they had to be shipped in from Los Angeles. Because all of the State of New Mexico snow equipment was being used to rescue people that were snowbound, we had to truck in road-graders and Bobcats from Arizona. Once the snow was moved to the center of the streets the graders pushed it to the outskirts of the town. It took three days to start to see dirt on the streets. This presented another problem. The streets were rapidly turning into mud! We then had to truck in dry dirt to spread over the wet streets. It took 200 truckloads of dirt that had to be evenly distributed and then aged with wagon ruts, horseshoe prints, etc. As the Town began to re-emerge, we ran out of time. The shooting crew returned and they started to film in the areas that we had unearthed. While they were shooting, we were digging out, frantically trying to stay ahead of them. We had a crew of set dressers with the shooting company moving around wagons full of hay and stringing up clothes lines to hide the gigantic piles of snow that ringed our set. The two vintage railroad cars arrived in the middle of all this and got stuck on the road into the set, effectively blocking all traffic in and out for a day. Eventually they were craned onto the tracks. The Railroad Workers’ Tent Village had to be dug out by hand. The tents were ripped and torn; some were decimated. All 50 tents were hauled to our set dressing warehouse for the drapery team to re-sew. After the tents were removed from the location, the snow was graded to the outskirts, fresh dirt was laid down and then we re-set the entire Tent Village. All this was done in five days. It had previously taken us two weeks. Three days after the crew returned there was another snowstorm predicted for the coming weekend. We didn’t know what to do. It did snow that weekend, but our set only got two additional inches. We purchased 12 leaf-blowers and blew the snow away. The wind chill was minus-five degrees on the second day of digging out the Tent Village—relentless, punishing. Then an amazing thing happened. One of the guys on our crew, a full-blooded American Indian, stood up and said, “Grandfather if you love your grandson, please stop the wind.” Five-minutes later, the wind stopped and it remained calm for the rest of the day. 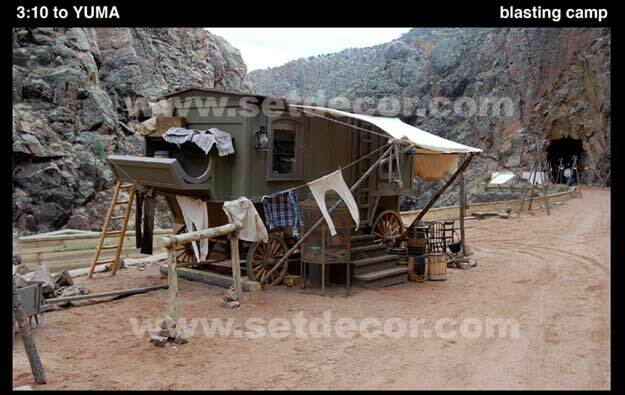 3:10 TO YUMA was by far the most physically challenging film I’ve done, but it had its mystical moments.